The PAW Patrol pups are back with daring new rescues and a new puppy crew member in PAW Patrol: Meet Everest! Fan-favorite Everest and high-flying rescue pup Skye embark on daring missions through the snow and ice to rescue their friends, protect stranded animals and guard their community!As the number-one preschool show on TV and featuring French and Spanish audio, PAW Patrol: Meet Everest! is sure to be a hit with all of its good-hearted, adventure-seeking fans. 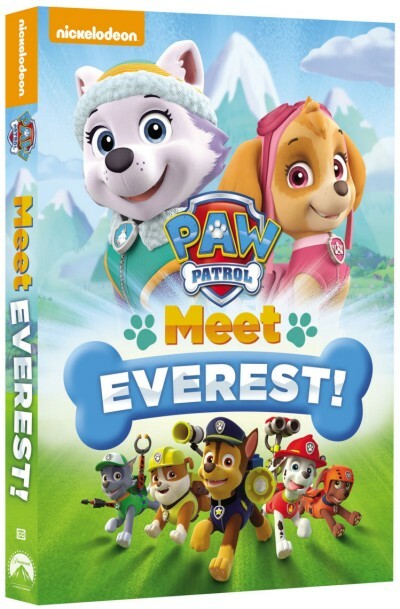 Produced by Nickelodeon Home Entertainment and distributed by Paramount Home Media Distribution, PAW Patrol: Meet Everest! will be available on DVD September 1, 2015 for the suggested retail price of $14.99. The New Pup: The PAW Patrol rolls out in their new PAW Patroller to save Jake when he gets stranded in the ice fields, but a new pup also pops up to lend a paw--the brave ranger, Everest! Pups and the Big Freeze: When a winter ice storm causes trouble all over Adventure Bay, Mayor Goodway's car hits an icy patch and gets stuck in the snow. Then, a train engineer can't break on the icy tracks as it heads for a huge snow drift on the crossing. It's up to Ryder, Rubble, and Everest to clear out all the snow and ice! Pups Save the Deer: When a family of deer gets separated on slippery ice and a snowy hill, it's up to Zuma and Everest to lead an icy rescue to reunite them! Pups Make A Splash: When Cap'n Turbot's boat runs aground, Ryder, Zuma, Skye, and Rocky must team up to save it before it sinks! Pups Save A School Day: Alex loses his back pack on the first day of school! Ryder and the Paw Patrol need to help him find it before the school bus comes. Pups and the Trouble with Turtles: Tons of Baby Turtles start to pop up all over town and it's up to Ryder and the Pups to corral them all and get them back to their pond. Pups Save A Flying Frog: Marshall's new pet frog, Smiley, is going to be in a jumping contest! The only problem is that during a practice run Smiley jumps right into Skye's helicopter and it takes off! Now Skye and the Pups have to save Smiley, and get him to the competition in time! This is my grandson's favorite show! They would love to watch this!